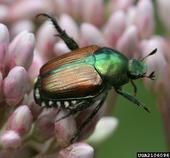 Seeing Japanese beetles in your California landscape? Not likely. Have you seen big green beetles in your California yard or garden? Or beetles feeding on your roses or other plants? There are many kinds of beetles commonly found in our landscapes, but the Japanese beetle is not one of them. Many people think they've seen the Japanese beetle, a small scarab beetle with metallic green wings with white spots on the margins. However, Japanese beetles are generally not found in California. When people think of parasites, often what comes to mind are blood-sucking insects like bed bugs, head lice, and fleas or other bodily invaders on or in humans and other animals. But plants can have parasites too. Most of us are familiar with mistletoe but there is another parasitic plant you may not have heard about: dodder. What's That Beetle in My Roses? If you grow roses, you might be noticing damage on the flowers caused by hoplia beetles (Hoplia callipyge). Hoplia beetles, which are common between March and May, especially in the Central Valley, feed on the blossoms of light-colored roses and other flowers in your landscape. Hoplia beetle adults are small, reddish-brown scarab beetles that are often found resting inside a blossom. If you hold one in your hand, you'll notice that most of the body is a beautiful, iridescent silvery green color in the sunlight. These beetles may also occasionally be found feeding on other plants with light-colored petals.